Old Navy: $1 Flip Flops! Today is $1 Flip Flop Day! Plus, in this week’s Old Navy ad, there is a $5 off $25 purchase coupon. Valid May 21, 2010 – June 3, 2010 in stores only! You can also try your hand at Barker’s Bones on the Old Navy Facebook Page for a printable coupon. 30% off entire store at Old Navy! 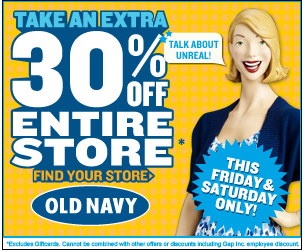 This Friday to Sunday Old Navy announced that everything in the entire store will be 30% off! Great time to go take a look at what they have for summer! Old Navy: Classic Polo’s $5 on Saturday! 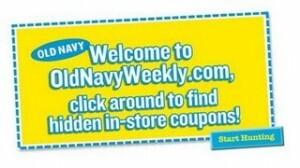 As many of you know Old Navy has stopped doing their Old Navy Weekly with the printable coupons. All their deals will be found on facebook from now on. Tomorrow (Saturday) Old Navy will have their Men’s Classic Polo’s for only $5! PLus, If you are making a trip don’t forget to print this 30% off any single item coupon HERE! From today until Sunday you can get graphic tees for the whole family for just $5 at Old Navy. Details HERE. Use THIS printable to get an additional $10/$50! Old Navy killer online deal! Thru 2/4, Ebates is offering 20% cash back when you make purchases on OldNavy and if you’re new to Ebates, you’ll score a $5 sign up bonus! Plus, you can get an additional 15% off any purchase on OldNavy and FREE shipping on $50 or more by using promo code ONSAVEBIG when checking out. Thanks My Dallas Mommy! •Purchase around $50 or more in items. •You will then receive 20% cash back from Ebates–which will put an additional $8.50 back in your pocket. And if you’re new to Ebates, you’ll get an additional $5 on top of that! Your final cost for $50 worth of Old Navy Clothes will be just $34 or ONLY $29 if you include the $5 sign up bonus! That’s not too bad… especially if you’re purchasing already discounted sale items too! I just ordered 7 maternity shirts for work from the clearance section for a total of $54.25. Plus I will be getting $11 back from Ebates. I saved over $120. Old Navy HUGE sale this weekend! No Old Navy Weekly coupons this week. Thank goodness, I was getting sick of missing everything! 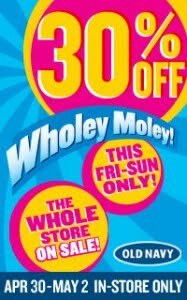 Instead we ALL get 30% off our entire purchase this Friday & Saturday at Old Navy! Stop over HERE for the scoop. Thanks Moms by heart! What coupons are you looking for this week at OldNavyWeekly.com! Shopping this weekend? 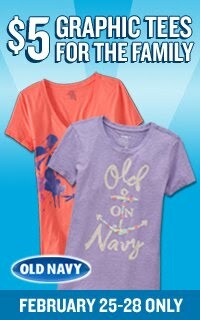 Print some Old Navy coupons to sweeten the deal! Click on the shoes of the 3 supermodelquins to the right, their shoes will turn pink and then your coupon will pop up. Swap the t-shirts to the right around for $10/$50 – 20% off. 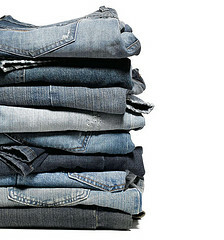 Today Saturday, Old Navy has $15.00 Adult Jeans and $10.00 Kid’s and Baby Jeans, while supplies last. In stores only! You can use the 25% off coupon below to make the deal even sweeter! Click the present for Dec.24th. Then keep clicking the arrow on the right until you come to the toddler girl’s fleece. Today only (Saturday) Old Navy has got $3 Sweatshirts and $1 Cozy Socks. Find a coupon at the Old Navy Weekly website HERE to make this an even better deal. I am getting ready to send my husband out in a few minutes, he does better fighting the crowds than I do! Wish him luck! ** Update, husband got home and was able to get the cozy socks! He said there was no one at the store, it was empty. He also thought the $3 sweatshirts were even too cheap for $3? So he didn’t get any, but he picked up a few of the striped $5 shirts for me, and used 2 30% off coupons on items. So he paid about $15 for 13 items! You are currently browsing the archives for the old navy category.